The humanitarian crisis is even worse than imagined in Haiti, as the death toll could reach 1,000. Small coastal communities cut off with residents starving as cholera spreads. Six days after Hurricane Matthew tore through southwestern Haiti, the first reports are emerging from the remote coastal region where the eye of the storm came raging ashore, bringing death and destruction and virtually obliterating the town of Les Anglais. On Saturday, a Massachusetts-based nonprofit was able to visit the beleaguered community of 40,000 people on Haiti's southwestern tip, known as the Tiburon peninsula, where local officials are dealing with a mounting health crisis due to a lack of medicine to treat victims as well as clean drinking water. “The situation we found there was absolutely horrific and much worse than we had thought,” wrote two U.S. doctors in a report shared on Facebook after reaching Les Anglais on a U.S. military helicopter and spending 90 minutes on the ground meeting local officials and visiting a hospital. “There is no clean water … There is no food. No electricity. No communication,” said the doctors, Lynn Black and Conor Shapiro with St. Boniface Haiti Foundation, which operates a hospital in southern Haiti. Cases of cholera had also begun to appear due to a lack of clean drinking water, they said. "We were the first people to land on the ground there. It was really astounding," Black told Univision News by phone. "Before we arrived they had no contact with anyone since the hurricane," she added. Local officials told the doctors there were 179 reported deaths and at least 700 hundred injured, some seriously. The large number of deaths appears to confirm fears that the official death toll in Haiti from Matthew, initially reported at 271, could reach as high as 1,000, making it the worst natural disaster in the country since a 2010 earthquake rocked the capital, Port-au-Prince, killing more than 200,000 people. Relief agencies fear that similar situations may exist along a broad stretch of inaccessible coast from the city Port Salut on the south of the peninsular to Jeremie in the north. "People are dying from a lack of basic healthcare as no one can get to them by road,” the doctors said. "This is an absolutely shocking crisis … it doesn’t seem like there is a plan to get food, water, and healthcare to these thousands of stranded people anytime soon,” they added. Having raised the alarm the doctors said they hoped that the U.S. military and international aid agencies would direct air drops to Les Anglais and other cut off communities. "We're trying to get out the word, these communities need help," said Black, adding that St. Boniface didn't have the resources to deal with the disaster. The United Nations appealed for $119 million on Monday to provide food, water and housing materials to 750,000 people in Haiti's southwest. "This is not a population on its knees, but on the ground," Pierre-Andre Dunbar, Haiti's ambassador to the U.N. in Geneva, told a news briefing. "Crops were also destroyed, which means the country will face a severe famine as the southwestern peninsula is considered the breadbasket of Haiti," he said. The only access to Les Anglais is by helicopter or boat as the only road access to the city of Port Salut has been cut off by collapsed bridges. Black and Shapiro said the death toll in Les Anglais only included the town itself, and there was little information about more remote hamlets inland. “There are only 82 standing homes out of 4,000,” they wrote. “People are sleeping outside." 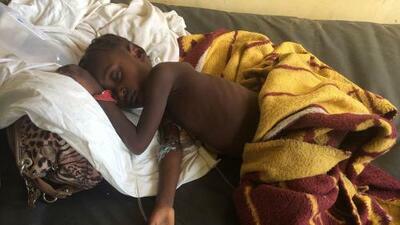 To make matters worse, case of cholera have begun to appear. “They have had 25 cases of cholera and 5 deaths since Tuesday including a man who was brought in dead while we were there,” the doctors reported. “There is no clean water. Everyone is now drinking contaminated water, the infants, children, everyone,” they added, fearing the number of cases would rise unless clean drinking water supplies reach the town quickly. Reuters reported doctors were treating 39 suspected cases of cholera in the nearby hard hit town of Port-a-Piment. The food situation in Les Anglais was also dire due to damage to fields. “The crops of millet, corn. legumes (vegetables), sweet potatoes were destroyed. The food they were able to protect from the storm was brought out and put in the sun to dry but quickly spoiled,” they said. Black said the people of Les Anglais were coping as best they could, but she wondered how long they could hold out. "They were incredibly gracious and kind when we were there, but you sensed they were crossing over into desperation," she said. "Adults can live without eating for several days, but babies and small children can't. And you can't treat cholera without clean water."